Total Transportation based in Rancho Cucamonga has been awarded the partner carrier of the year for 2018. This is the fifth straight year that Total has won this award. In presenting the award, Ingi Torfason, co-founder and Chief Operating Officer spoke about the value of having such a strong service provider as a partner in southern California. Total’s employees are always willing to go the extra mile to take care of the needs of our customers. 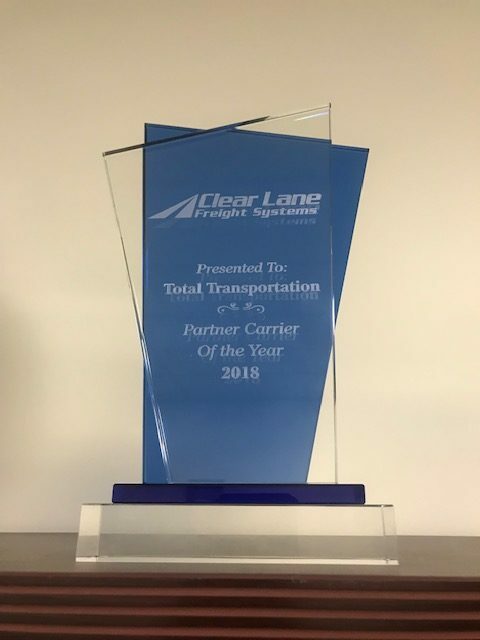 When Clear Lane Freight System was launched seven years ago, Total Transportation was the first partner we selected to work with. Ever since then we have had an excellent relationship that has allowed Clear Lane to grow our operations in the important southern California market according to Ingi Torfason.